This page is devoted to Intermediate Luminosity Optical Transient (ILOTS). Most broadly, these are astrophysical stars or stellar systems that experience outbursts with a peak luminosity somewhere between the peak luminosity of novae and supernovae. With my collaborators Romauld Tylenda and Amit Kashi we have developed theoretical understandings of some objects in this heterogeneous group of objects. Amit Kashi and I have placed ILOT on the Energy-Time Diagram seen below. We argue that most of them are powered by gravitational energy of stellar merger or accretion in a binary system. September 2016: ASSASN 15qi. We (Kashi & Soker, submitted to MNRAS in September 2016, posted on arXiv) constructed a scenario where the outburst of the young-stellar-object ASASSN-15qi is an intermediate luminosity optical transient (ILOT). In this scenario a sub-Jupiter young planet was tidally destructed on to a young main-sequence star. Unlike the case of the more energetic ILOT V838 Mon, the mass of the destroyed planet is too low to inflate a giant envelope, and hence the merger remnant stays hot. This ILOT possesses two interesting properties: (1) its luminosity and total energy are below those of novae, and (2) it is not as red as other ILOTs. May 2016: SN 2015bh (other names as used in the diagram: SNHunt 275 and PTF 13efv). We mark its 2013 eruption (Ofek et al. 2016 arXiv:1605.02450: an LBV giant eruption) & M31LRN 2015 (see point 7 below); both are discussed in Soker & Kashi 2016, posted on the arXiv May 24, 2016). Also added NGC4490-OT2011 (Smith, Andrews, Van Dyk, S.~D., et al. 2016, MNRAS, 458, 950). There is much confusion on the names to the intermediate transient objects. We use the following. ILRT: Intermediate-Luminous Red Transients. These are events resulting from evolved stars, such as asymptotic giant branch (AGB) stars and similar objects (e.g., RGB stars). Most likely a companion accretes mass and powers the eruption, e.g., NGC 300 OT. A similar process occurs in giant eruptions of luminous blue variables (LBVs). LBV giant eruptions or SN impostor. Giant eruptions of Luminous Blue Variables. Examples include the 1837-1856 Great Eruption of Eta Carinae and the pre-explosion eruptions of SN 2009ip. ILRTs are the low mass cousins of LBV giant eruptions. LRN or RT: Luminous Red Novae, or Red Transients or Mergerbursts. These are powered by a full merger of two stars. Examples: V838 Mon and V1309 Sco. Merger events of stars with sub-stellar objects are also included. ILOT: Intermediate-Luminosity Optical Transients. ILOT is the term for the combined groups of ILRT, LRN and LBV giant eruptions. They share many common physical processes, in particular being powered by gravitational energy. Our naming scheme and diagram do not include low luminosity supernovae and similar objects, such as Ca-rich transients and .Ia SNe (for these see Kasliwal, M. M. 2013, IAU Symposium, 281, 9). Observed transient events on the Energy-Time Diagram (ETD). 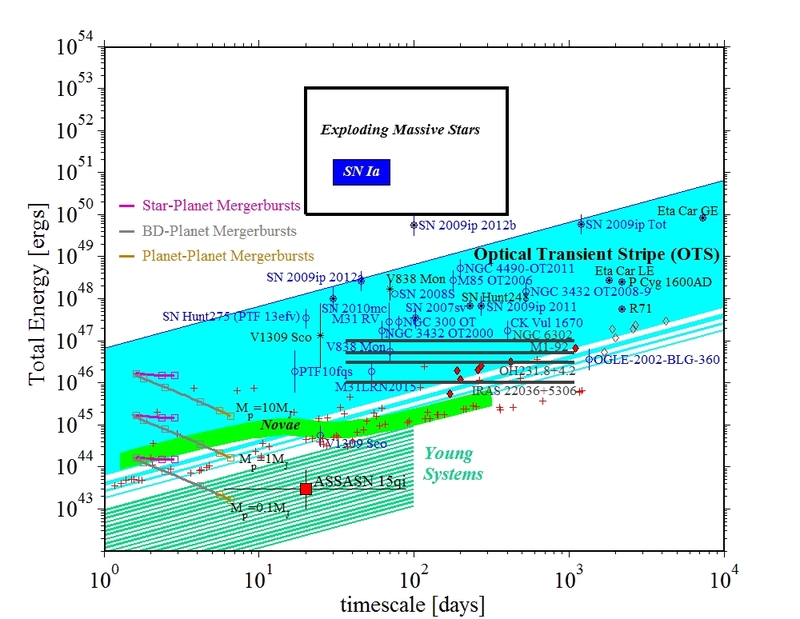 We suggest that most of these systems are powered by gravitational energy released from either a vigorous mass transfer process from the evolved primary star to a main sequence secondary star, or the merger of two stars (Kashi & Soker 2010). Blue empty circles represent the total (radiated plus kinetic) energy of the observed transients as a function of the duration of their eruptions. The duration of an eruption is usually (but not always) defined as the time for the luminosity to decrease by 3 magnitudes. The Optical Transient Stripe (OTS), is a more or less constant luminosity region in the ETD. It is populated by Intermediate Luminosity Optical Transients (ILOTs). Mergerburst events are marked by blue filled circles. Where a model exists to calculate the total available energy, it is marked by a black asterisk above or overlapping the blue circle. The total energy does not include the energy which is deposited in lifting the envelope that does not escape from the star. Where a model exists to calculate the gravitational energy released by the accreted mass (the available energy) it is marked by a black asterisk. The supernovae region is schematically marked by a rectangle. The green line represents nova models computed using luminosity and duration from della Valle & Livio (1995). Nova models from Yaron et al. (2005) are marked with red crosses, and models from Shara et al. (2010) are represented with diamonds. The Horizontal lines represent planetary nebulae (PNe) and pre-PNe that have been suggested to have been formed by ILOT events (Soker & Kashi 2012). The estimated kinetic energies of the components that expand with a linear velocity-distance relation in each of the bipolar planetary nebulae and pre-PNe are marked by horizontal lines. The time scale is an estimate of our proposed model. (1) The calculated location of the eruptions of SN 2009ip are marked by red squares for the individual 2011, 2012a and 2012b outbursts, and as a black square for the total three years activity (SN2009ip Tot). It has been assumed that the total energy is twice the radiated energy for all eruptions of SN 2009ip. (2) Yellow star represent the estimated location of the pre-explosion outburst (PEO) of SN 2010mc (Soker, N. 2013, arXiv:1302.5037). (4) CK Vul ((Nova Vul 1670). Erupted in 1670 Hajduk et al. (2013) suggested it might have been an ILOT. (7) M31LRN 2015. Energy range is 1-3 times radiated energy (to take into account kinetic energy). This is a LRN (Williams, S. C., Darnley, M. J., Bode, M. F., & Steele, I. A. 2015, ApJ, 805, L18; arXiv:1504.07747). (8) SN Hunt248. This SN Impostor experienced an eruption with 3 peaks and returned to its pre eruption luminosity in about 230 days (Kankare et al. 2015 and references therein). Its position in the ETD is close to that of the first 2012 peak of SN 20009ip. This diagram is collected from the following sources where detail explanations and the sources for the different objects are given: (Kashi et al. 2010; Kashi & Soker2010; Bear et al. 2011; Soker & Kashi 2012).